Native American dancers participate in the Grand Entry at the 2018 Kyiyo Celebration at UM. 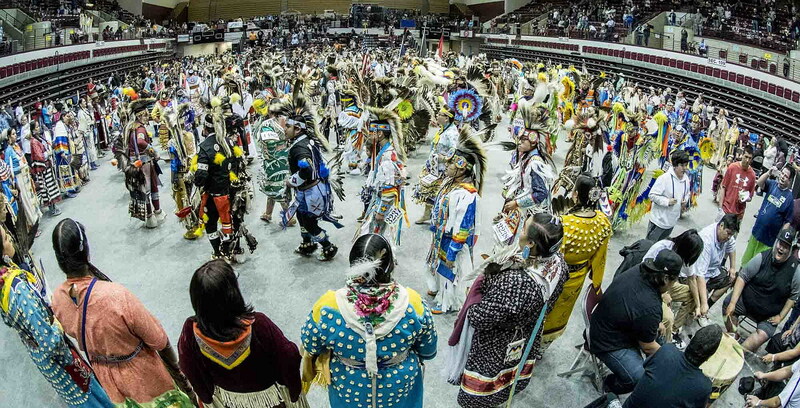 Some of the best Native American dancers and drum groups in North America will gather at the University of Montana on Friday and Saturday, April 19-20, for the 51st Annual Kyiyo Celebration in the Adams Center. Hosted by the Kyiyo Native American Student Association, the event is one of the oldest student-run powwows in the country and allows the Native American community to share its culture with the UM campus, Missoula and beyond through traditional dance and song. The two-day event will feature dancing and drumming contests, a basketball tournament, vendors and more. Grand entry times are at 7 p.m. on Friday, and noon and 7 p.m. on Saturday. Kenneth “Tuffy” Helgeson will lead the celebration as this year’s master of ceremonies, along with other prominent community members. Black Otter is this year’s host drum group. Shawntyana Bullshoe will serve as Miss Kyiyo; Mikayla McHugh will be Junior Miss Kyiyo; and Iriana Old Elk will be Little Miss Kyiyo. The Kyiyo Native American Student Association plays an integral role in promoting the cultural traditions and customs of all Native Americans. Through extracurricular activities offered throughout the year, Kyiyo engages UM students and employees in the cultural identities of Native Americans to support cultural diversity. Admission costs $5 per grand entry, or $12 for a weekend pass. Children age 6 and under and seniors age 65 and older are admitted free. Tickets and passes can be purchased at the door. Dancer registration costs $5 and drummer registration costs $50 for 10 passes. Registration is available at the door. People who volunteer for 3.5-hour shifts during the powwow will receive free weekend admission. Sign up for a volunteer shift by following this link.